Sometimes when dining out, I like ordering a nice salad like Wendy’s BBQ Ranch Chicken Salad. I love the different flavor combinations that get my creative juices flowing- I enjoy recreating the salads at home for a quick weeknight dinner. While this salad requires a bit of extra preparation, it’s delicious and will make a great addition to your meal plan! It’s also an excellent way to use up leftover grilled chicken. You may like it so much that you plan on grilling extra to ensure leftovers for this salad! There are two sauces on this salad- a honey BBQ glaze and BBQ ranch. If that’s too much BBQ flavor for you, do the glaze and then just use plain ranch as the dressing. The fresh lettuce, blackened corn, and freshly chopped vine ripened tomatoes make for a flavorful salad that you are going to love. 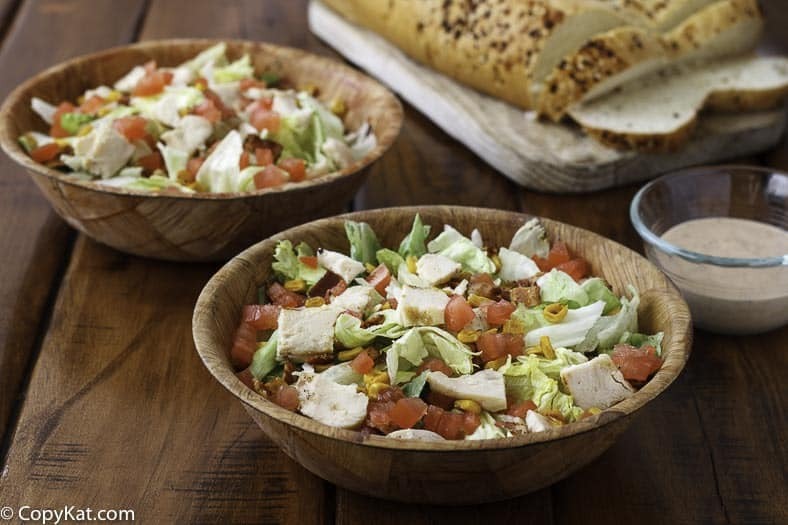 You are going to love this Wendys BBQ Ranch Chicken Salad. This would be a great salad to bring to work with someone for lunch. Do you love Wendy’s? I have more copycat Wendy’s menu items to try. 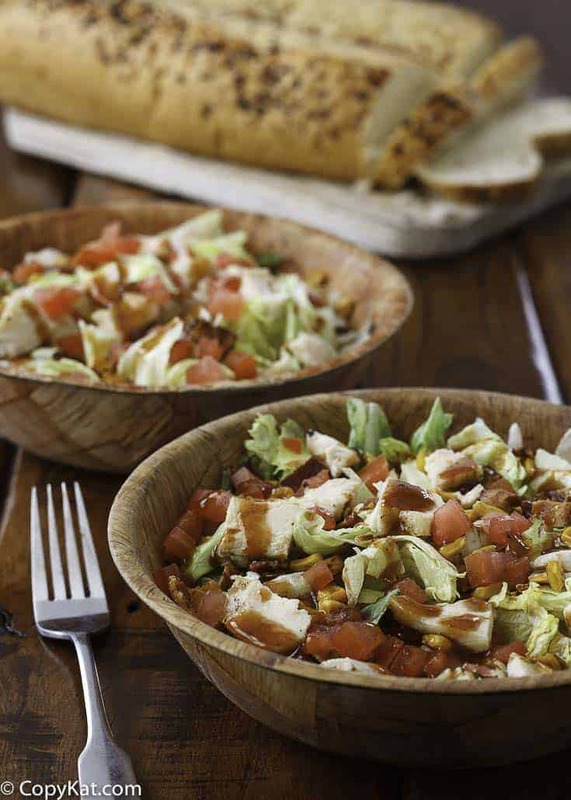 Wendy's makes a flavorful BBQ Ranch Chicken salad you will want to make at home. In an iron skillet, cook the corn over medium-high until it begins to blacken. Be careful as this will happen quickly and you don’t want it to burn. Remove from skillet. If your chicken isn’t already cooked, turn the heat to medium and add 1 teaspoon olive oil in the same skillet. Sprinkle your chicken with ¼ tsp salt and ¼ teaspoon black pepper. Cook chicken on one side in the skillet until edges are opaque, about 7-10 minutes. Turn over and cover and cook about 10 minutes more or until a meat thermometer registers 165 degrees. Let rest for 5 minutes. Cut the chicken into bite-sized chunks. Place the salad greens in the bowl and add the chicken, corn, tomatoes, and bacon. Mix the honey with 1 tablespoon of the BBQ sauce and drizzle over the salad. 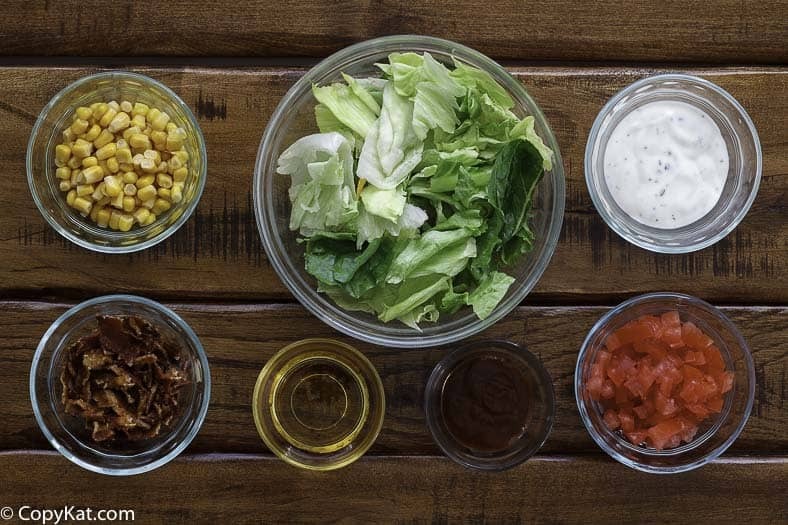 Blend the remaining BBQ sauce with the ranch dressing and serve with the salad. I thought Wendy’s gave packets of a Visalia Onion dressing by Marietti’s for this salad. A few times I read through the ingredients hoping I could recreate the dressing and seemed there was a some smoke flavor in addition to the base of oil, vinegar, onion, and sugar. I remember the drizzling of a dark red barbeque sauce, which you achieve through your glaze but wasn’t the actual dressing some unique Marzetti’s Visalia dressing and not Ranch? I loved this salad! Why did they stop making it?! I love this salad from Wendy’s but they aren’t making it anymore. Thank you for posting this!! I am glad you enjoyed the salad! Is there a certain kind of BBQ sauce you recommend? There’s smoky, tangy, Carolina, spicy…. which is best? I adore chicken salad! Thank you for sharing this fantastic recipe! I’ve never eaten this at a Wendy’s but it sounds delicious. Looks delish ~ thanks for all that you do.